Mühlhausen is a municipality in Upper Palatinate, about 15 kilometres south of Neumarkt. It comprises of 21 districts. SPANGLER has been commissioned to equip two sewage plants and a waterworks with modern and up-to-date control systems for this growing municipality, and to adapt the systems to the requirements of digitalisation. “You can’t just switch off a waterworks for conversion. Therefore, the neighbouring waterworks are currently providing water for the citizens as an emergency network. Over the course of the year, Mühlhausen will then return those water quantities in order to settle the balance sheet”, explains Hubert Rackl, Sales Manager at SPANGLER, regarding the importance of the systems. The Siemens S5 control units which had been in the plants have been removed during running operations, and the existing programmes adapted to the new PLC type S7-1500. In order to upgrade the systems with state of the art technology, a control system has also been installed. There were already several systems in use which individually controlled various functions, such as water treatment and water supply. Four of these systems have now been merged by SPANGLER into one modern control system. On the hardware side, this interconnects with the PLCs and directs the data to a PC control room, but it also enables location-independent operation via mobile devices, such as tablets or mobile phones. This refurbishment pays off for the customer because instead of several control systems they now only have to manage one, and can connect to various systems via the access rights of one system. 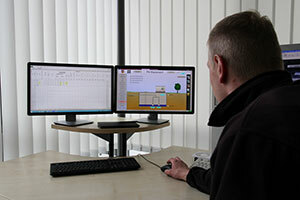 Further modules for this technology, such as regular data storage, fault message administration and automated reporting for the water authority (Wasserwirtschaftsamt) DaBay, are also included in the solution.